US, 1951, 113 minutes, Colour. Gene Kelly, Leslie Carol, Oscar Levant, Nina Foch, Georges Guetary. 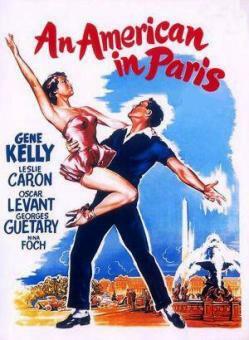 An American in Paris won the Oscar for the best film of 1951 (although its director, Vincente Minnelli, did not win – although he did win in 1958 for Gigi with Leslie Caron, the star here, and for the writing of Alan Jay Lerner, who wrote the screenplay for An American in Paris. The film was one of the most celebrated of musicals, winning Oscars for best colour set direction and art direction, cinematography, costume design, scoring of a musical film as well as story and screenplay for Alan Jay Lerner. It won Golden Globe awards for best film and the Writers’ Guild of America for screenplay. The film is the work of Gene Kelly. He choreographed the film, especially the seventeen-minute ballet with which the film concludes which is considered a classic of its kind. Kelly had emerged during the 1940s at MGM as a star dancer. He co-directed On the Town and Singin’ in the Rain with Stanley Donen. He chose Leslie Caron as his star for this film and she began a Hollywood career over many decades, returning to France in her later years. Nina Foch is the wealthy woman who has designs on the artist. George Guetary sings “Stairway to Paradise” and Oscar Levant gives a lot of sardonic comment throughout the film. The music is by George Gershwin with such ever-popular songs as “It’s Very Clear” and “I Got Rhythm”. 1. How good a musical was this? It received the Oscar in 1951. How well did it deserve it? 2. The use of musical conventions of song, dance, colour, light plot, light characterization? How did they blend for communication? 3. How much realism was there in the portrayal of the hero? in this presentation of Paris and themes, characters? How much fantasy? The blend of reality and fantasy, as visualized? 4. The film's reliance on colour, choreography, Gershwin music and lyrics, the final ballet? 5. The impact of the opening and setting the scenes the numerous aspects, the irony of an American in Paris? 6. How interesting and sympathetic a hero was Jerry? Gene Kelly's style, his own self-mockery, the world of art? How seriously was he meant to be taken? How much did he develop as a character during the film? 7. Lise as heroine? How seriously to be taken? The visual introduction and her dancing various styles of personality? The waif aspect of Leslie Caron's performance? Her capacity for love and loyalty? How much did she change and develop during the film? 8. The minor characters such as Jerry's piano-playing friend, the singer, indications of theme in their performances? 9. The American patroness and her style? What comment being made an rich Americans, their possessing and patronizing people? emotional response to Jerry's response to her? 10. The contribution of the songs to the plot and the atmospheres the spontaneous songs? The contrived songs such as Stairway to Paradise? ll. How well did the film prepare visually for the ballet? Preparing the ingredients that were stylized in the final ballet? What were the main characteristics of the ballet, its enlivening the whole film, fantasy sequence revealing the significance of this American in Paris? 12. What were the high points of the film, serious and comic? How well do musical comedies communicate these themes?